Pumpkin Spice Latte - Frugal Mom Eh! 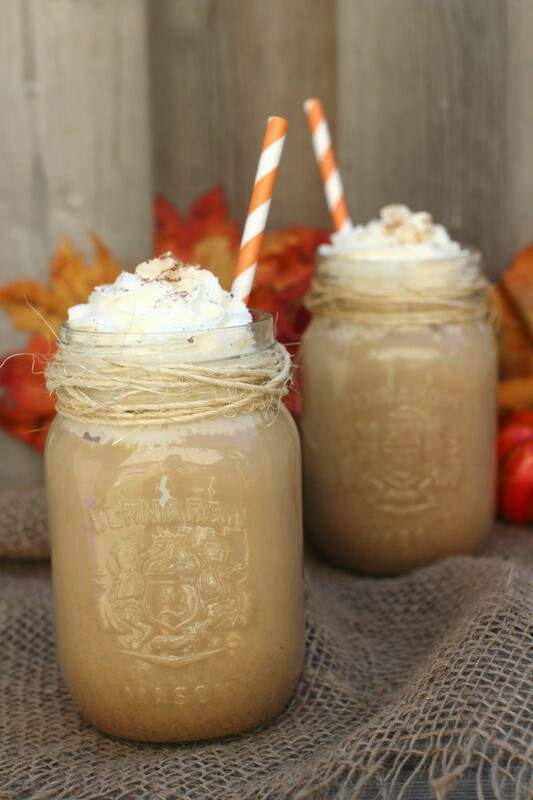 This Pumpkin Spice Latte is a classic fall beverage that can be enjoyed both hot and cold! I love Starbucks, I do. I just always find myself struggling to get the stroller and two babies through the door, usually while being stared at by other patrons. This has forced me to get creative with re-creating my favourites. The Pumpkin Spice Latte isn’t actually one of my favourites, I much prefer a Chai Tea Latte but I know many love this seasonal treat. I don’t suggest actually serving this in mason jars. The glass really conducts the heat and I felt like I was touching the sun after filling these up! I just wanted to show the finished colour of the latte rather than taking a picture of whipped cream in a mug. In a medium saucepan, heat the pumpkin and spices over medium-high heat for 2 minutes, stirring constantly. Add Milk, Sugar and vanilla to the saucepan, and heat until hot being careful not to bring it to a boil. Put the mixture into a blender and blend until smooth and slightly frothy then add the coffee and blend until just combined. Pour into two large mugs and top with whipped cream and a mixture of nutmeg, ginger, cloves and cinnamon if desired. *Note: Chill the Pumpkin Spice Latte and serve over ice for a cold version. Chill the Pumpkin Spice Latte and serve over ice for a cold version. There are so many PSL versions floating around! I think I need to try one!! The nice thing about making it at home is the amount of sugar!! My favourite was the new latte for Chinese New Year, Peach Blossum?! Oh, my! It was soooo good!!! mmmm I’m not a fan of pumpkin but I like it enough to know this would be a real treat! My girls are going to love it thanks chick! Decaf coffee would work…other than that I am not sure what you would replace the coffee or espresso with. 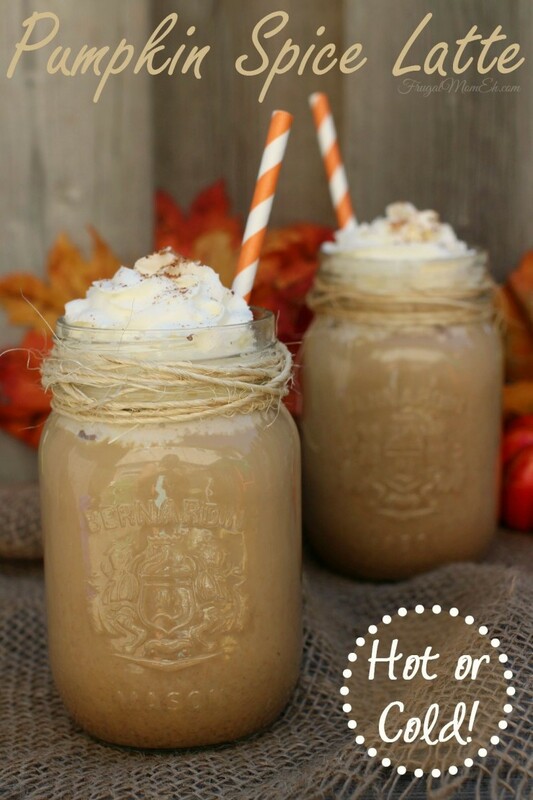 By far my favorite fall drink – I dont tend to buy them too often from the coffee shops as they are pricy; so I really like the idea of making my own at home 🙂 Yum! Ooooh, this looks delicious! I love PSL! Totally gonna try this. Thanks for sharing! Mmmmm, sounds so good, I haven’t tried these yet at any of the coffee shops and that is because of the price of them, but I am going to try this!! You’re killing me, Elizabeth! All your awesome pumpkin recipes and now this!! 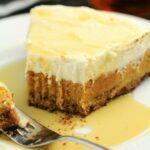 I will definitely be giving this recipe a try! I love how you served them in a mason jar! haha! There is more to come too, I went a little pumpkin crazy a couple weeks ago. I LOVE Starbucks’ PSL! However, over the years, many people have been saying that their PSL’s are super unhealthy, so it’s great that we can make our own and know exactly what goes into each cup! So, thanks for sharing!! I can’t wait to try this recipe myself! I absolutely LOVE this. I definitely prefer mine hot over cold. Making sure to pin this to my pumpkin craving board because I must make! oh this just has to be delicious! Oh that sounds soooo yummy! 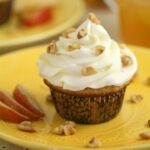 I wonder if you can make a batch to keep in refridgerator (up until the blending part), then add the coffee /whip cream every morning. This sounds delicious. I love trying different recipes. Definitely one to make. This sounds like the most delicious way to treat myself when I need a boost.I love the sound of the pumpkin flavor and the blend of spices in it.Thanks so much for sharing this Latte. These sound delicious! I love the way you served them up in the mason jars! Thank you for this recipe for Pumpkin Spice Latte. This would make a delicious fall and /or winter drink as it looks and, I imaging, tastes so delicious! Sounds so yummy and I am just learning and experimenting on making smoothies. So I must give this one a go !!!! I love anything pumpkin. Can’t wait to try. This looks yummy! Can’t wait to try making this at home. Thanks for sharing. This looks yummy! Can’t wait to try making this for company over the holidays. Can’t wait to try this tasty drink!! 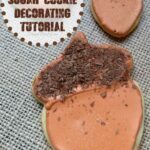 I love pumpkin and will have to try this out, thanks for posting! 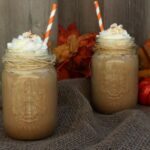 (Pumpkin Spice Latte) This is one yummy drink that I will make for my daughter and I when fall comes around again. I would love to make this for my family looks so delicious everyone would enjoy it! I love anything pumpkin… I would substitute chicory or Postum for the coffee — caffeine gives me the jitters. 😉 This looks absolutely delicious. I can’t wait for the cool fall days to come so I can sip this slowly and read a good book! Thanks for sharing! This looks and sounds so scrumptious!!!!! Just had to pin it! I am just starting to learn to make different smoothies and this one will definitely be a favorite! It will soon be the perfect time of year for these! Pumpkin Spice is the best autumn treat. It’s almost the season for pumpkin spice! Now that it’s September I am totally in the mood for this! I like that I can control how much sugar is in it when I make them at home. looks delish and I love your food styling! These look so delicious. Thanks so much for the great recipe! I have yet to try these and I hear a lot about them. i will have to make them, they do sound good! 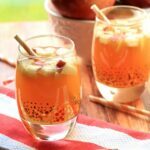 Love your presentation of this yummy drink. What size mason jars did you use? Can I use instant espresso powder?